In these columns I sometimes deal with questions that have complex answers—using AppleScripts or other workarounds to get iTunes to do what you want, for example. This week I’ve chosen some very simple questions that, nevertheless, perplex many iTunes users. I look at updating an iOS device to iOS 8 if you don’t have a lot of free space, using an older iPhone as an iPod, sorting songs alphabetically, and a way to keep iTunes Match from messing with your tags. Q: I want to update my iPhone 5 to iOS 8, but it tells me there’s not enough free space. It says I need 4 GB of free space to install the update, and I only have 1 GB free. What can I do? When you update an iOS device, you need the amount of space for the update itself, plus space to hold temporary files in case something goes wrong. So you need a lot more free space than the size of the download. While you can delete items on your device from the Settings app (Settings > General > Usage), the easiest way to update it is through iTunes. Connect the device to your Mac, launch iTunes, and it will ask you if you want to update it. If it doesn’t, select the device and then, in the Summary tab, click Check for Update. Using this method you won’t need to free up any space on your iPhone, unless it’s full to the brim. iPhone to iPod: Is it possible? Q: I bought an iPhone 6 and I want to be able to use my older iPhone 5 as an iPod. How do I do this? When you get a new iPhone you may want to keep the old one around as a backup. Or, as this correspondent asked, as a sort of iPod to play music and access apps. There’s nothing complicated about this. Just remove the SIM card from the old iPhone (you’ll find its tray on the right side of the device as you look at it) and you’ll be able to use it for everything other than those features that require cellular access. You won’t be able to make or receive calls or SMS messages, but you will be able to use it for FaceTime calls, iMessages, and more. Plus, you’ll have a backup phone in case your new device goes on the fritz. Should that happen just pop your SIM card in the old iPhone again and it will work as a phone. Q: How can I alphabetize a list of songs in iTunes? iTunes lets you sort your music, either in playlists or in the Music library, in many ways. The easiest way to do this is either in Songs view in the Music library (which displays all your music in a list), or in a playlist. You can choose to display a number of columns for your music—and other iTunes content—according to the kind of track information you want to see. Each of these columns displays data about each track—song name, album name, artist, and so on. You can choose which columns to display in any list view by pressing Command-J and accessing the View Options window. Once you’ve decided which columns to display, you can sort by any of these columns. If you want to sort by alphabetical song name, just click the header for that column. If the arrow in the header is pointing upward, the sort order is A – Z. If it points down, it sorts in Z – A order. To change the sort order, just click that column header again. View your music in list view, and sort by any column. Here, the Name column is highlighted because I clicked it to sort by that tag. 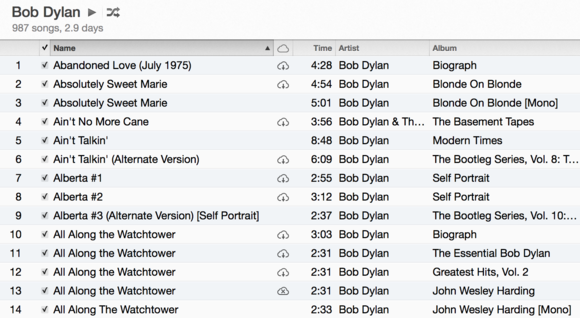 In the above screenshot, I’ve sorted my Bob Dylan collection by name, in alphabetical order. You can also sort by artist, album, time, year (if you’ve filled in the Year tags), and more. Q: I want to send an app as a gift to a friend in Canada. I’m in the US, and I get a message from iTunes saying that I can’t do this. Can you tell me what to do? Don’t mess with my tags! Q: What happens to your existing tags if you use iTunes Match, then delete all matched songs that can be upgraded to 256 Kbps AAC, and then download the iTunes versions? I’ve spent a lot of time perfecting my tags and I don’t want to lose what I've already done. iTunes Match retains your tags, so there’s nothing to worry about. 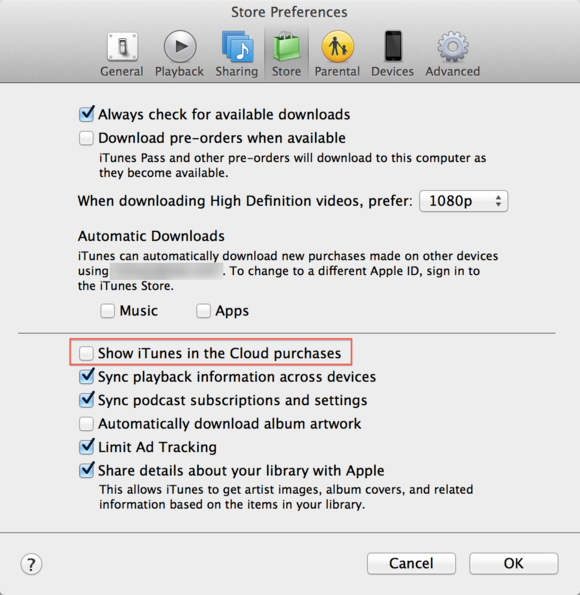 However, I’ve found that if you have the Show iTunes in the Cloud purchase option enabled in the iTunes preferences, it will replace tags for purchased music. I accidentally loaded my iTunes library with that option switched on when I set up a new Mac from a clean install, and it reset all the play counts and last played dates for my iTunes Store purchases. iTunes Match won’t change your tags, but there’s an iTunes Store setting that might.